Place oats, pepitas and nuts in a large bowl. Mix together the olive oil, spices and honey and mix into the oat mixture. Spread over a large baking tray and bake at 160C for 15-20 minutes until golden brown. Stir halfway through cooking. 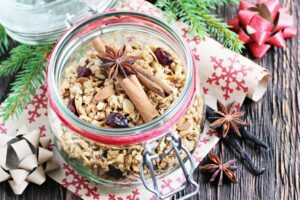 Pour granola into little jars and tie with ribbon for a great homemade gift!